Ezra–Nehemiah is the original combined version of the biblical books of Ezra and Nehemiah—the two were originally one, but were divided by Christians in the 3rd century CE and in Jewish circles in the 15th century. Covering the period from the fall of Babylon in 539 BCE to the second half of the 5th century BCE, it tells of the successive missions to Jerusalem of Zerubbabel, Ezra, and Nehemiah, and their efforts to restore the worship of the God of Israel and to create a purified Jewish community. The narrative is highly schematic, each stage of the restoration following the same pattern: God "stirs up" the Persian king, the king commissions a Jewish leader to undertake a task, the leader overcomes opposition and succeeds, and success is marked by a great assembly. In the 19th century and for much of the 20th, it was believed that Chronicles and Ezra–Nehemiah came from the same author or circle of authors (similar to the traditional view which held Ezra to be the author of all three), but the usual view among modern scholars is that the differences between Chronicles and Ezra–Nehemiah are greater than the similarities, and that Ezra–Nehemiah itself had a long history of composition from many sources, stretching from the early 4th century down to the Hellenistic period. 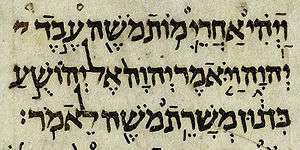 A page from the Leningrad Codex with the text of Ezra 10:24–Nehemiah 1:9a. The break between the books is designated by a single blank line. Ezra–Nehemiah is made up of three stories: (1) the account of the initial return and rebuilding of the Temple (Ezra 1–6); (2) the story of Ezra's mission (Ezra 7–10 and Nehemiah 8); (3) and the story of Nehemiah, interrupted by a collection of miscellaneous lists and part of the story of Ezra. God moves the heart of Cyrus to commission Sheshbazzar "the prince of Judah", to rebuild the Temple; 40,000 exiles return to Jerusalem led by Zerubbabel and Joshua the high priest. There they overcome the opposition of their enemies to rebuild the altar and lay the foundations of the Temple. The Samaritans, who are their enemies, force work to be suspended, but in the reign of Darius the decree of Cyrus is rediscovered, the Temple is completed, and the people celebrate the feast of Passover. God moves king Artaxerxes to commission Ezra the priest and scribe to return to Jerusalem and teach the laws of God to any who do not know them. Ezra leads a large body of exiles back to the holy city, where he discovers that Jewish men have been marrying non-Jewish women. He tears his garments in despair and confesses the sins of Israel before God, then braves the opposition of some of his own countrymen to purify the community by dissolving the sinful marriages. The list of those who returned with Zerubbabel is discovered. Ezra reads the law of Moses to the people and the people celebrate the Feast of Tabernacles for seven days; on the eighth they assemble in sackcloth and penitence to recall the past sins which led to the destruction of Jerusalem and the enslavement of the Jews, and enter into a covenant to keep the law and separate themselves from all other peoples. Nehemiah takes measures to repopulate the city and returns to Susa after 12 years in Jerusalem. After some time in Susa he returns, only to find that the people have broken the covenant. He enforces the covenant and prays to God for his favour. In the early 6th century Judah rebelled against Babylon and was destroyed (586 BCE). The royal court and the priests, prophets and scribes were taken into captivity in Babylon. There the exiles blamed their fate on disobedience to God and looked forward to a future when a penitent and purified people would be allowed return to Jerusalem and rebuild the Temple. (These ideas are expressed in the prophets Jeremiah (although he was not exiled to Babylon), Isaiah, and, especially, Ezekiel). The same period saw the rapid rise of Persia, previously an unimportant kingdom in present-day southern Iran, and in 539 BCE Cyrus the Great, the Persian ruler, conquered Babylon. The Mercer Bible Dictionary notes three notable theological themes in Ezra and Nehemiah: God's use of foreign rulers for Israel's sake; opposition to Israel from foreign neighbours; and the need to separate Israel from foreign neighbours to preserve the purity of the people of God. In the last half of Nehemiah the emphasis shifts to the joint role of Ezra and Nehemiah in instructing the people in the Law and in the dedication of the wall, these two activities together forming the reconstitution of Jewish life in Jerusalem; Dillard and Longman describe this as the moment when "the whole city becomes holy ground." Another common theme of Ezra–Nehemiah is the concern for endogamy, or marriage within one's own group. Katherine Southwood emphasizes that Ezra and Nehemiah are similar in their views of intermarriage in that both Ezra and Nehemiah allude to the Deuteronomic text in their narratives, and believe intermarriage to be a type of transgression. There are other similar nuances that lead some scholars to believe that they are from a similar source. However, there are also differences in thee two sources that should not be forgotten. Firstly, the intermarriage debate is between different classes of people, each of which is trying to reserve their sense of ethnicity. Ezra argues that marriage with non-exilic Jews is a transgression, and Nehemiah emphasizes that marriage to non-Jews is a sin. Even though this book says specific groups, the book of Ezra prohibits all exogamy. According to Christine Hayes, Ezra is concerned about the holy seed being profaned since he believes God has chosen his people as being holy. Since anyone that is not inside of the chosen group is considered not holy, it would be sinful to marry and reproduce with them, according to Ezra. Interestingly, scholars also believe that there were further political reasons behind Nehemiah's protest against intermarriage, and Ezra had a variety of different reasons. In either case, these two viewpoints on intermarriage with exogamous groups have differences, but ultimately, each is trying to promote and protect the ethnicity of their own group. Southwood goes on to discuss that both Ezra and Nehemiah display a "consciousness of ethnicity', though Southwood focuses primarily on Nehemiah's case, and the importance of the relationship between ethnicity and language. In Nehemiah specifically, the women that the Jews have married are named specifically as from 'Ashod, Ammon, and Moab' (Neh. 13:23). The concern is then expressed that the Ashodites were connected to Nehemiah's statement of outrage when he says that 'half of their children spoke the language of Ashod... and they were not able to speak the language of Judah' (Neh. 13:24). There is some debate as to how different the language of Ashod was from the Hebrew. However, if the languages were similar, according to Southwood, the problem at stake would be the purity of the language. If this were an entirely different language altogether, the purity of the language would be concern, as well as the concern for the threat of the extinction of the Hebrew language. In either case, the religious and ethnic identity that is encapsuled with the Hebrew language was being put at stake. Southwood makes the point that Nehemiah's objection to intermarriage with foreign women, especially those aforementioned, relates to language being the symbol of ethnicity; therefore, it is not the language itself that is the problem, but rather the preservation of language is a "symptom of deeper concern about protecting ethnic identity." Thus, Southwood holds that both Ezra and Nehemiah are concerned about the legitimacy of their groups in relation to the experience of the exile, though Nehemiah's concern specifically emphasizes language as a potential means by which ethnicity seemed to be defined. Katherine Southwood makes some huge points in her article in how the terms, race, ethnicity, and nationalism are used throughout the text of Ezra 9-10. She points out that there are multiple problems not only inside the text but in work of the scholars as well. Although it is evident that the terms ethnicity and race have similarities one is just a secondary term of another. This however does not make the text easily translated and makes the expression of those terms as Southwood puts it not " appropriate" on any level. More of the issue lies with a bigger picture such as people from the land are not really different from those who have the "holy seed" since there are so many similarities that there seems to be a common attraction between the two. The argument there is that the writers of the text focus more on the difference between the "people of the land" and the "Holy seed" than explaining the physical difference such as skin color, hair color. In the text the term ethnicity may be the best to describe the people in general, but in terms of the intermarriage Southwood feels that nationalism and ethnicity both do justice. Using the term race she claims is not needed and is used in a negative manner. Along with Southwood, Hayes also talks about the "holy seed." According to Hayes, Ezra and Nehemiah appear to promote the ban of intermarriage with all Gentiles. According to Hayes, Ezra is not a racial ideology that is concerned with purity of blood. The logic behind this ban is not the purity of blood, but the religious notion of Israel as a "holy seed". The holy status of the Israelite's is not racially based, but religiously based. With intermarriage the holy seed of Israel becomes mixed with the profane seed. In other words, intermarriage violates the holy seed of Abraham and Israel. The Masoretic text of Ezra–Nehemiah is composed largely in Late Biblical Hebrew, with significant sections in "Official Aramaic"; there are occasional reflections of Old Persian vocabulary, but little significant influence from Greek. The Hebrew Ezra–Nehemiah was translated into Greek by the mid-2nd century BCE. The Greek and Roman rendering of Ezra's name is Esdras, and there are two versions of the Greek Ezra–Nehemiah, Esdras alpha (Ἔσδρας Αʹ) and Esdras beta (Ἔσδρας Βʹ). Esdras beta, which is still used in churches of the Greek-speaking and other Orthodox Christian traditions, is close to the standard Hebrew version, but Esdras alpha (or 1 Esdras) is very different: it reproduces only the material that pertains to Ezra, and ignores Nehemiah. Ezra 1 (the decree of Cyrus) and Ezra 2 (the list of returnees) are presented as Persian documents; Ezra 3–6, which contains further supposed Persian documents mixed with third-person narrative, may be based on the prophetic works of Haggai and Zechariah, who were active at the time; Ezra 7-10, partly in the first-person, is sometimes called the "Ezra Memoir", but has been so heavily edited that the source, if it exists, is very difficult to recover. There is widespread agreement that a genuine memoir underlies Nehemiah, although it has clearly been edited. It can be no earlier than about 400 BCE, but is probably later, possibly even as late as 336–331 BCE (the reign of Darius III, the last Persian king); it probably circulated as an independent document before being combined with Ezra. There are seven Persian documents embedded in Ezra–Nehemiah, six in Ezra and one in Nehemiah. All but one are in Aramaic, the administrative language of the Persian empire. Many scholars accept these as genuine, but a study by Lester Grabbe indicates that while genuine Persian documents may underlie a number of them, they have been reworked to fit the purposes of later writers. Hugh G. M. Williamson (1987) sees three basic stages to the composition of Ezra–Nehemiah: (1) composition of the various lists and Persian documents, which he accepts as authentic and therefore the earliest parts of the book; (2) composition of the "Ezra memoir" and "Nehemiah memoir", about 400 BCE; and (3), composition of Ezra 1–6 (the story of Zerubabbel) as the final editor's introduction to the combined earlier texts, about 300 BCE. More recently Juha Pakkala (2004) has carried out an extensive analysis of the layers in Ezra. He sees the account of the rebuilding of the Temple (Ezra 5:1–6:15) and the core of the "Ezra memoir" (Ezra 7–10/Nehemiah 8) developing separately until they were combined by an editor who wished to show how Temple and Torah were re-introduced into Judah after the exile. This editor also added Ezra 1–5. The combined text was then further developed by priestly circles who stressed Temple over Torah, transformed Ezra from scribe to priest, and stressed the primacy of the Babylonian returnees over those who had remained in the land, a distinction that had not appeared in the original Ezra material. Still later, Levitical editors combined Ezra and Nehemiah to produce the final form of the book, reintroducing interest in Torah and stressing the primacy of the Levites. Lester Grabbe (2003), based on various factors including the type of Aramaic used in the youngest sections and the ignorance of Ezra–Nehemiah as a single book displayed by other Hellenistic Jewish writers, suggests that the two texts were combined, with some final editing, in the Ptolemaic period, c. 300 – c. 200 BCE. The order of the two figures, Ezra and Nehemiah, is perhaps the most debated issue regarding the book. Ezra 7:8 says that Ezra arrived in Jerusalem in the seventh year of king Artaxerxes, while Nehemiah 2:1–9 has Nehemiah arriving in Artaxerxes' twentieth year. If this was Artaxerxes I, then Ezra arrived in 458 and Nehemiah in 445 BCE. Nehemiah 8–9, in which the two appear together, supports this scenario. In 1890, however, it was proposed that Ezra's Artaxerxes was Artaxerxes II, and that the sequence should be reversed, with Nehemiah arriving in 445 and Ezra in 398 BCE. The argument has some persuasive evidence; for example: Nehemiah's mission is to rebuild the walls of Jerusalem, and Ezra 9:9 notes that Ezra found the walls in place when he arrived, and while Nehemiah lists the returnees who came back with Zerubbabel he seems to know nothing about the 5,000 or so who accompanied Ezra. Nevertheless, there are counter-arguments to each of these and other arguments, and the 398 date has not replaced the traditional one. A proposal that the reference to the "seventh year" of Artaxerxes (Ezra 7:7–8) should be read as "thirty-seventh year", putting Ezra's return in 428 BCE, has not won support. Hayes, in her article on impurity in Ancient Jewish society, states that it is commonly misconceived that the expulsion of the Gentile wives was a result of Judaean exceptionalism and nationalism. Hayes points out that the theory is not correct arguing that the root cause is largely a fundamental and core belief found within the religious laws of the Judaeans. Ezra, Hayes explains, imagined Israel as divinely ordained to remain pure and holy, set apart and without the influence of other nations in Canaan, just as the Priestly division were commanded, by God, to practice marriage exclusivity. In reaction to contemporaries, such as Hayes and Klawans, who argue that Ezra–Nehemiah's purity ideology is a product of conservative "ritual" and "moral" purity, independently; Olyan claims that Ezra–Nehemiah's alien expulsion mandate was a result of a melding ideology taken from, the two seemingly independent ideas of, "moral" and "ritual" purity and remains exclusive to the particular narrative of Ezra–Nehemiah. Moral purity has familial implications, which the lack of may cause disruption in the cohesiveness of the family unit. Transgressing Israelite moral structure was feared to cause violations of the commandments, which ordained by God, must be adhered to maintain ethnical identity. The influence of gentile women and culture upon Israelite men and posterity, through the eyes of ancient Judaean Priests, could turn Yahweh worshippers towards foreign deities and hedonism. Ritual purity stresses the importance of keeping to sacred practices dictated by revered predecessors and the Holy Scriptures. Olyan believes that Ezra's expulsion of the gentiles could also be linked with the idea that outside lineage would initially pollute the priestly bloodline, acting as an apparatus to destroy "right" ritual practice. Another scholar, Paul Heger, takes a different stance on the expulsion of the Gentiles in Ezra–Nehemiah. According to Heger, Ezra’s motive for expelling Gentile women and their offspring was because at the time leaders believed that the identity of the Israelites did not depend of the ethnicity of their mothers, but depended on the seed of their fathers. The motive behind prohibiting intermarriage with all Gentile women was due to the danger of assimilation resulting from the influence of social interaction with the surrounding nations. The expulsion of the foreign women and their offspring was directed in order to preserve the purity of the Israelite “holy seed”. Thus, Ezra did not introduce the idea of matrilineal identity. Ezra begins with Cyrus entrusting the Temple vessels to Sheshbazzar, "prince of Judah"; this apparently important figure then disappears from the story almost entirely, and Zerubbabel is abruptly introduced as the main figure. Both are called governors of Judah and are both credited with laying the foundation of the Temple. A number of explanations have been proposed, including: (1) the two are the same person; (2) Sheshbazzar was in fact Shenazzar, Zerubabbel's uncle (mentioned in Chronicles); (3) Sheshbazzar began the work and Zerubbabel finished it. Ezra's mission according to Nehemiah 8 was to apply "the law of Moses" in Jerusalem, which he does by reading a "book of the law of Moses" (a "scroll" in Hebrew) in a marathon public session: the question is, what was this law-book? Some scholars have suggested it was some form of Deuteronomy, since Ezra's laws are heavily skewed towards that book; others have proposed that it was the "Priestly Writing", which probably dates from the Persian period; a third suggestion, and most popular, is that it was a form of the Torah, as it was clearly associated with Moses and contained both Deuteronomistic and Priestly elements; and the fourth view is that Ezra's law-book is lost to us and cannot be recovered. ↑ "Scholarly Site: Leningrad Codex: Biblical Text". ↑ Dillard, Raymond B.; Longman, Tremper (January 1994). "Ezra-Nemehiah". An Introduction to the Old Testament. Grand Rapids, MI: Zondervan. p. 179. ISBN 978-0-310-43250-0. LCCN 2006005249. OCLC 31046001. Retrieved 2012-02-24. ↑ Southwood, K. E. 2011. ‘“And They Could Not Understand Jewish Speech”: Language, Ethnicity, and Nehemiah’s Intermarriage Crisis’. The Journal of Theological Studies. doi:10.1093/jts/flr030. ↑ Southwood, Katherine (May, 2012) " Ethnicity and the mixed marriage crisis in Ezra 9-10: An Anthropological Approach". Oxford Scholar Online. ↑ Hayes, Christine (January 16, 2012). "Intermarriage and Impurity in Ancient Jewish Sources". The Harvard Theological Review. 92 (1): 3–36. ↑ Hugh G. M. Williamson, Ezra, Nehemiah, Word Biblical Commentary Vol. 16 (Dallas:Word, 1985), pp. xxi–lii. ↑ Gary N. Knoppers, I Chronicles 1–9, Anchor Bible Commentary Vol. 12 (New York:Doubleday, 2003), pp. 80–89. ↑ "A History of the Jews and Judaism in the Second Temple Period (vol. 1)". ↑ Hayes, Christine (1999). "Intermarriage and Impurity in Ancient Jewish Sources". Harvard Theological Review: 9. ↑ Olyan, Saul M. Purity Ideology in Ezra-Nehemiah As a Tool to Reconstruct the Community. Brown University. ↑ Heger, Paul (2012). "Patrilineal or Matrilineal Genealogy". Journal for the Study of Judaism. 43: 215–248. doi:10.1163/157006312x637865.